The Florida Gators opened their 2018 season with a win, opening the Dan Mullen era on the right foot in Gainesville. After a tumultuous few years of roster turnover from a player and coaching personnel standpoint, Mullen’s hot start is perhaps the cure for Gator fans’ ills. Before we get too far, however, it must be stated that this opening game was against Charleston Southern, a team pegged as the 35th-best FCS team to start the year. Regardless of the opponent, PFF’s grading of every player on every play gives us much to learn from the opening performance of the Florida team for the 2018 season. 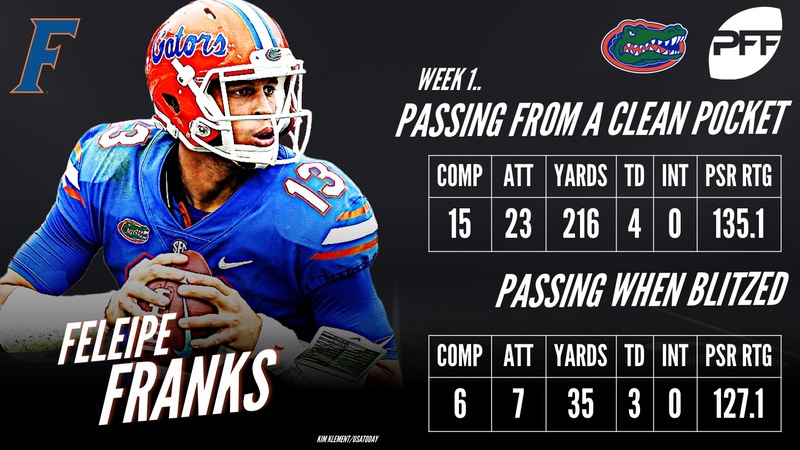 Despite the clear difference in talent level on the field, QB Feleipe Franks had by far his best performance at quarterback for the Gators. He strung together a strong game from both an accuracy standpoint and as a poised, dominant signal-caller regardless of the situation. Franks connected on 16-of-24 attempts for 219 yards and five touchdowns on the general box score but when you break down the PFF advanced statistics, Franks’ day gets that much better. Franks utilized the benefit of a play fake with great success, fielding a 142.4 passer rating on play-action passes. He completed 12-of-16 attempts and four touchdowns while averaging 9.2 yards per attempt on play action. When the Buccaneers sent extra rushers, as they did on nine dropback attempts, Franks was unbothered. He completed 6-of-7 passes and three of his touchdowns when Charleston Southern blitzed and was surgical when kept clean from pressure in the pocket, a very common occurrence in this game. When not under duress, Franks hit 15-of-23 passes for 216 yards and four of his five touchdowns for a ridiculous passer rating of 135.1. Equally as ridiculous, Franks was kept clean on all but two of his dropback attempts as his offensive line did not allow a single pressure all game long and the two pressured dropback attempts were not to blame on any one particular person. Speaking of that offensive line, all five starting offensive line put forth plus pass-blocking grades for their effort and the Gators rushing attack forced eight missed tackles and gained 111 yards after contact on the ground. Four of the five starting offensive linemen received plus run-blocking grades with only Martez Ivey seeing a below average grade in that regard on the afternoon. 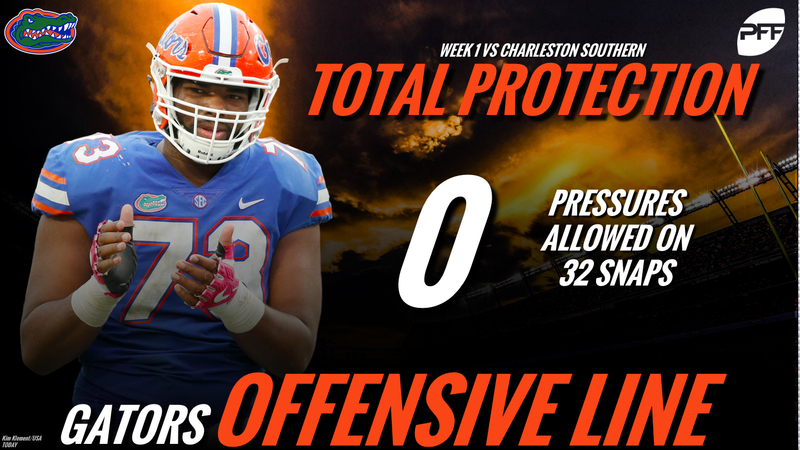 On the defensive side of the ball, Mullen’s squad limited the Charleston Southern offense to just seven points while also generating 15 pressures and 30 defensive stops as a unit. 40 defensive players saw action on the field while Rayshad Jackson and Cj Henderson each equally impressed. Jackson tallied four solo tackles, all four of which resulted in an offensive loss for the Buccaneers. Henderson was targeted just twice in this contest, allowing one reception for negative yards and forcing an incompletion on the other. The Gators’ next opponent will certainly be a jump in competition as they take on Kentucky as a lot of the success in the game against the Wildcats will be derived off the play of Franks but also the defense. Can Franks hit his transfer receivers again for early success and can the bookend tackles at Florida keep Franks upright against one of the better pass-rushing units across the SEC? If they do, Florida fans may be looking at a ‘2’ in the win column on Saturday night.